October 2, 3, 4, 5 & 6, 1973. This will be our 25th season as a dramatic society and we intend to make it a gala occasion. The WICK A.G.M. was held very late this year – only just in time for a comment in these notes. Dramatic changes have taken place in the Officers and Committee. Three long-serving members are taking a well earned rest from management – Barrie Bowen, Vice President and Chairman; Jean Porter, Hon. Secretary and Betty Dawes a Founder Member in 1948. They will still be very active in the company but will have more time to enjoy their acting, which no one would want to deny them considering the great amount of work they have got through in organising our workshop and putting the company on a firm financial footing. George and Audrey Laye are also retiring after three years of work on the Committee but, again, George is so active in set construction and Audrey in producing that the company will still benefit from their enthusiasm. Now to the new team; George Porter was elected Vice-President, Ann Baker, Hon. Secretary and Monica Joyce Assistant Hon. Secretary. France Thorne, Jack Bingham, Bill Mack and Roger Stott were elected to the committee. Sheila Deasey remains Hon. Treasurer and Mike Donkin and Richard Porter serve a further term and provide the committee with continuity. These fresh minds should keep the WICK wheels working efficiently and we can expect some exciting new ideas for your future entertainment. Our old Committee have planned a wonderful programme of plays for this season. Following this play in December Audrey Laye produces The Amorous Prawn. The New Year sees George Porter’s production of Night of the Iguana and the season is completed with an exuberant romp – An Italian Straw Hat produced by our old friend Nikki Le Roy. This our last play of the season is next May. FRANCES MOULTON first saw Trelawny of the Wells as a child and her interest in drama stems from that time. The desire to direct Pinero’s comedietta has long been her ambition and, as in most longstanding ambitions, confidence tends to disappear when the moment of truth arrives. Whatever thoughts went through Frances Moulton’s mind as to whether she had done justice to the delightful Trelawny must have been banished after the first night of the Wick Theatre Company’s production of it. Her direction could hardly be faulted. The Barn Theatre has a relatively small stage and anyone who can direct 12 people on that stage at one time without making it seem overcrowded deserves a bouquet. But it was not only that conjuring trick that points to the director being the star. The movement of the play throughout the four acts and four scene changes was fluid and never detracted from some amusing and poignant lines. The play, set in Victorian times, follows the fortunes of Rose Trelawny, a star of the Bagnigge-Wells Theatre Company, her love of Arthur Gower, grandson of Vice-Chancellor Sir William Gower [Ralph Dawes], and her acting friends. It is a gentle and amusing play that boasts no villains, but a host of characters. There is a beginning, middle and end and no hidden message. There is no need to wrack your brains, just sit back and enjoy a charming story as it unfolds before you. As with the direction of the play it is difficult to fault the players. There is such a varied type of character that everyone tends to pick a favourite and Tom Wrench [played by Barrie Bowen], the kind, budding playwright and actor who is so obviously in love with Rose, will fit the bill for many. Rose has a difficult part, having to be virtually three different people, but making sure the transition from one to the other is smooth and almost unnoticeable. Hilary Wiltshire manages well. 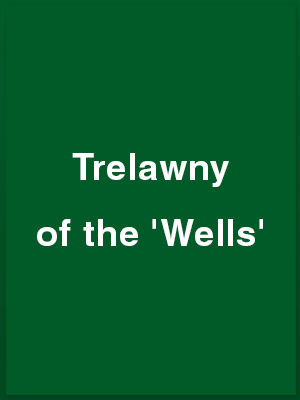 There are two more performances of Trelawny of the Wells, tonight [Friday] and tomorrow. It is well worth a visit. Trelawny of the Wells presented by the Wick Theatre Company at the Barn Theatre, Southwick, is a colourful, pleasing play. It has charm, is quietly amusing and there isn’t a “message” to be seen. Rose Trelawny, beautifully played by Hilary Wiltshire, is a star performer in the theatrical company run by Mr and Mrs Telfer. The near-aristocratic Arthur Gower woos and wins her, but the stern disapproval of his family, the iron Vice-Chancellor Sir William Gower and his sister Miss Trafalgar Gower, causes the romance to take an unexpected turn, but of course all ends happily. There are some excellent performances from Brian Moulton as James Telfer, actor of the old school applying the style and declamatoire to his every utterance, and from Betty Dawes as his devoted and practical wife. Neil Shephard and Alison Lee are Ferdinand Gadd and Avenia Bunn, Later Mrs Gadd. Tom Wrench, who ultimately writes his successful play, is Barrie Bowen. The comedian of the company, Augustus Colpoys, is Nikki Le Roy. Imogen Parrott, formerly of the Telfer company but now a leading player with the Royal Olympic Theatre, is Miranda Bowen. Other ‘theatricals’ are Alan Upton, Helena Dryzyga, Roy Roberts, Bill Mack and Michael Donkin. Ralph Dawes gives a firm characterisation of Sir William Gower, with Mary Payne as his sister. Roger Job has the part of Arthur Gower, and he makes him a very likeable young man who rebels against the discipline imposed by his grandfather.